**If you are a LP Hong’s disciple or know of LP Hong and have faith in him, this is an opportunity to worship holy amulets from LP Hong. Ceremony: Amulets were blessed by LP Hong. LP Hong is a well-known respectable monk in Thai history. He was born on Thursday the 24th March B.E. 2460 (C.E. 1917) in Surin Province. He got ordained as a novice at the age of 18. When he was 20, he got ordained as a monk at Wat Petchburi, Tumbon Toongmon, Amphur Prasart, Surin Province. After 3 months of ordination, LP Hong went on a pilgrimage in Cambodia. In Cambodia, LP Hong met many guru masters and studied magic with them. He spent 30 years on pilgrimage in Cambodia. LP Hong was a good monk and a magical expert. LP Hong calmly passed away on 5 March 2014 C.E. at age 97. Note: The real amulets may be different from the pictures because these pictures are examples. **Special Service: We are welcome to provide our Luang Pu customers Katha in text and MP3 and instructions for the amulets. **Power: LP Hong was a good monk. His mercy will help and protect the worshiper. Features: The amulet contains a metal bead. So, when you shake the amulet, you will hear a sound. 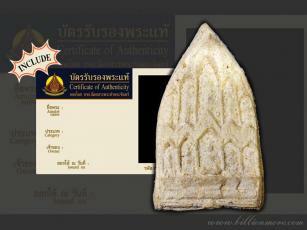 Info: The word “Kring” in Phra Kring comes from a metal bead in amulet that sounds when it is shaken. **Power: Phra Kring is a very auspicious amulet. 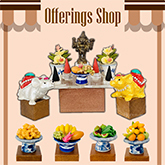 Thai people believe Phra Kring can make the wishes of the wisher come true, bring wealth, good luck, prosperity, happiness and safety to the worshipper and also make the worshipper recover from illness or diseases. **Power: Phra Phrom (Lord Brahma) is one of the 3 most important deities of Hinduism worshipped widely in Hinduism and Buddhism. People believe Phra Phrom as lord who built the world and created humans and all creatures. People believe Phra Phrom has duty of protecting the world, human and animals, in addition, fix all people’s fortune in the world. Therefore, worshipping Phra Phrom will bring good luck, safety, peace, prosperity and good things to life. **Power: Nang Kwak is a benevolent spirit. 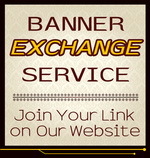 She is deemed to bring good business that makes the business owner make a lot of profit. So, she can be seen in almost every business establishment in Thailand. "I have received it yesterday. Thank you very much. Beautiful piece."